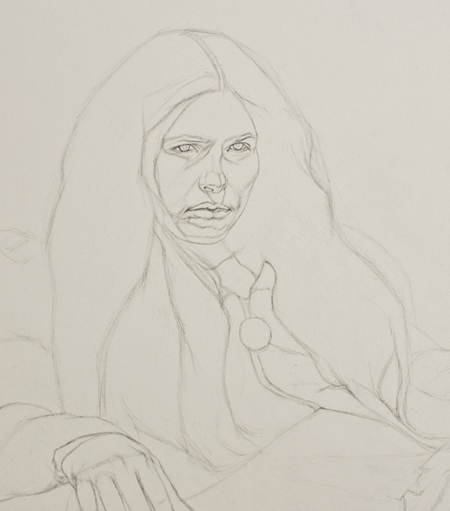 The point is that learning how to draw hair can feel like an ever-changing, daunting task because it varies so much from hairstyle to hairstyle, requiring you to be very flexible and creative in your approach. In this tutorial we will look at concepts to help you problem solve your way through all of your hair drawing sagas. 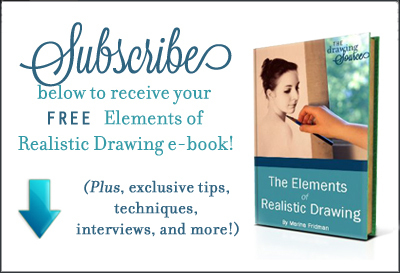 At the end of this article, download a free How to Draw Hair Infographic! This drawing scenario is quite challenging. How do you go about drawing the hair when it is as busy and detailed as this? Most often I suggest to draw all block ins using straight lines. 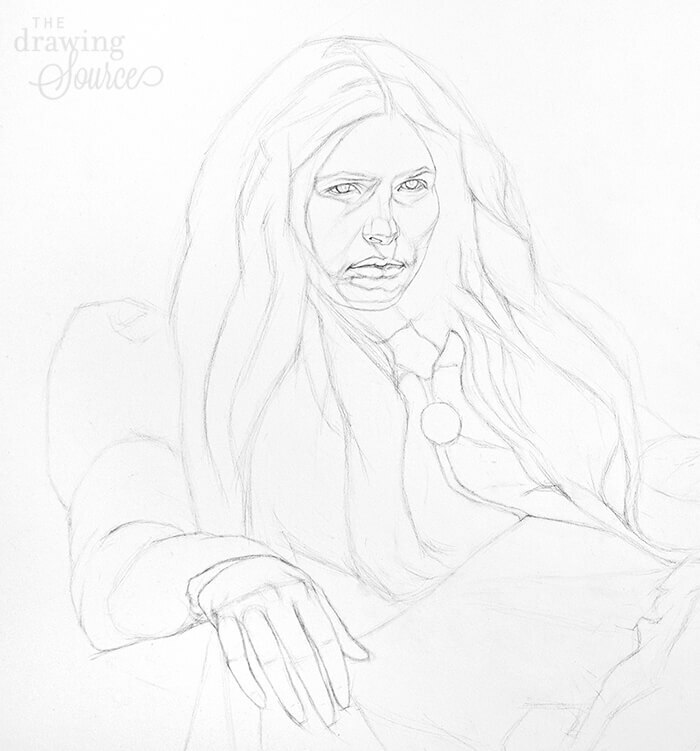 However, in this case I am drawing the hair almost exclusively with curved lines because I want to achieve a feeling of "flowing" hair right from the beginning of the drawing. When learning how to draw hair, one way to reinforce this flow and interconnectedness while improving the accuracy of your drawing is to look for rhythms. You can think of rhythms as invisible, curved lines that flow from one element of a picture to another, creating a kind of underlying structure that connects all the elements in an image. In the above image, you can see that even though my drawn lines are not literally connected, the blue line suggests how the eye might travel from one to another. 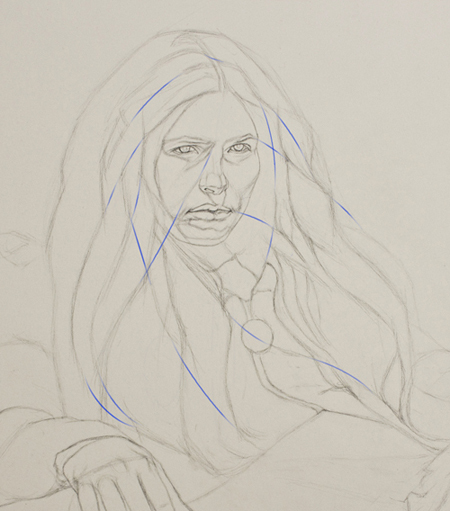 In this way, you can make sure that every line visually leads to another line in the drawing. This is where I will stop working on my block-in with line. It doesn't make much sense to go into more detail at this point because I will lose some of my drawing when I start drawing in values. 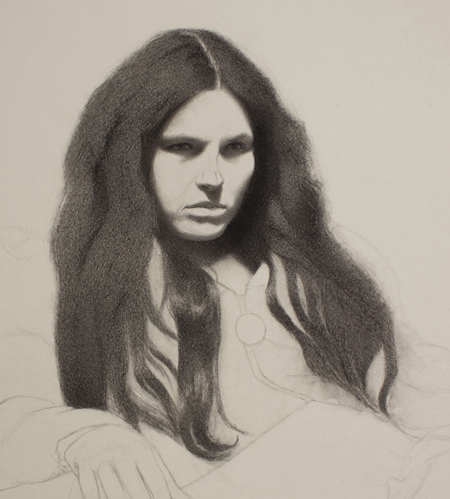 However, just because I am moving to value drawing does not mean that the block-in stage is over. I bring this up because especially in this kind of drawing scenario, it is easy to get caught up in details just because they are there. Instead of becoming a slave to what is in front of you, let the goals you set for your drawing dictate the amount of detail you draw, and when your drawing is "finished". For example: My tendency is actually to simplify hair, as I did in the drawing to the left for my previous portrait drawing tutorial. That Actually Looks Like Your Model's! If you squint at this image (one of the most effective methods of simplifying what is in front of you) you will notice that much of the hair masses together, showing us how close in value it is. The gradations in the hair are very subtle, especially when you compare them to the contrast in the face. To simplify, I will start with the most obvious values: the lightest and darkest, and work my way to the most subtle. 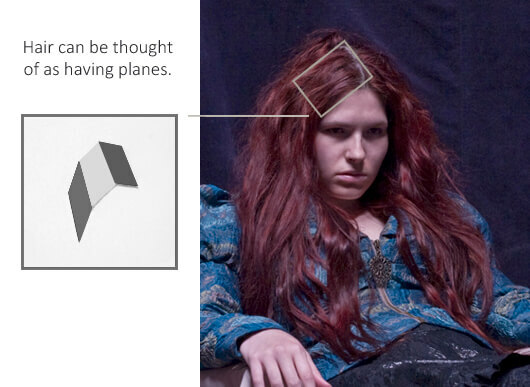 The lightest value can be left as the white of the paper, and the darkest value is just to the right of the face (our right, the model's left). To take this one step further, when I squint at the model I notice that the darkest value masses together with the slightly lighter area of the hair right next to it, creating a distinct dark shape (that kind of looks like a dog at the top). Drawing the shapes specific to your subject creates a likeness. whether it is a still life, portrait or figure. Throughout this drawing I will be looking for shapes, beginning with general ones and moving towards more and more specific ones. It's worth repeating: The specificity of shapes is what creates a likeness. I am continuing to find and draw the dark shapes in the hair. This stage is still the "block-in", only using value instead of line. Everything I draw is still tentative, subject to change, and there is really no rendering yet. Looking at the bottom section of hair under the chin: All I have done here is find the dark shape, find the approximate light shape with my eraser, and slightly gradate in between the two. I haven't evened out the values, yet it is already starting to look like dimensional hair, especially when compared to the surrounding flat shapes. This is a strategy I will use throughout the drawing: finding the dark shapes, then the light shapes, and gradating in between the two to get the half-tones. 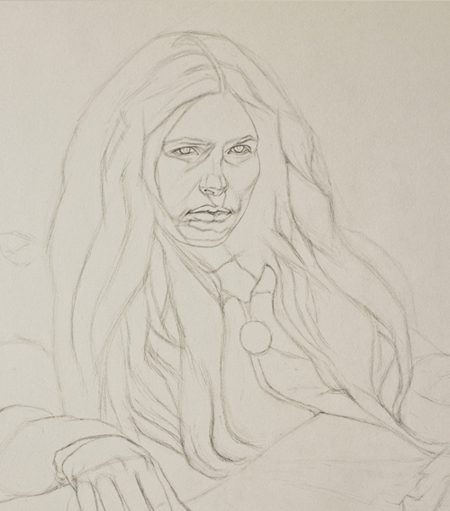 However, before I continue I should establish the rest of the values in my picture by drawing the face. 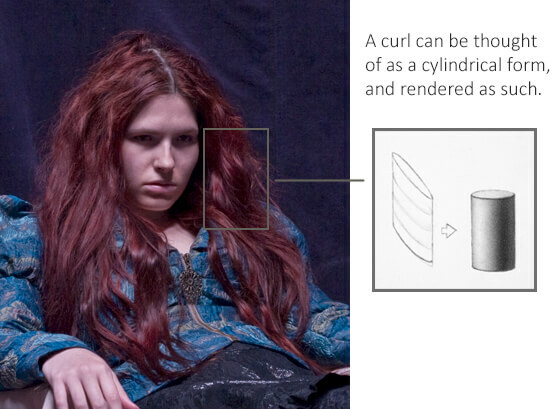 Since this tutorial focuses on how to draw hair, I will go through rendering the face in only a few steps. For an in-depth step by step tutorial on shading the face, please click here. 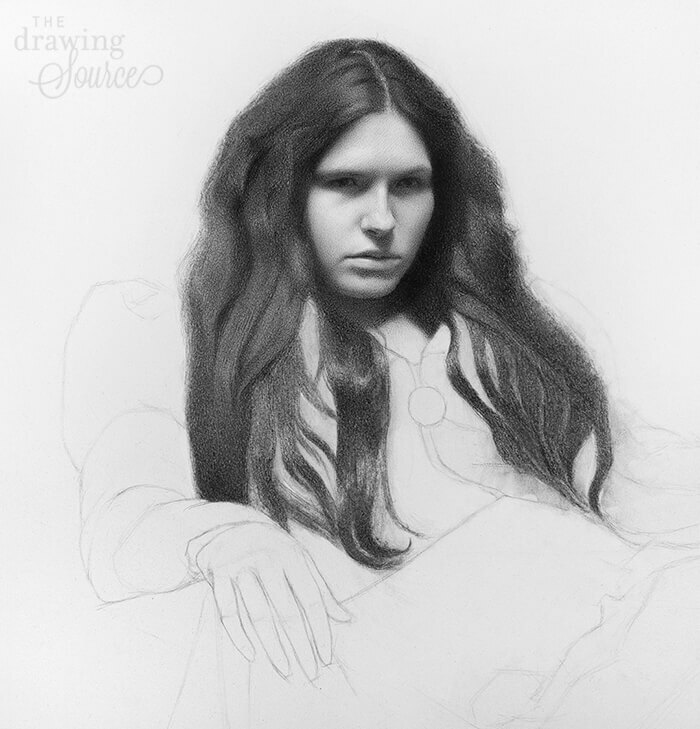 I begin rendering by massing in the shadows (remember: specific shapes = likeness!) From here I start gradating from the shadows into the half-tones. 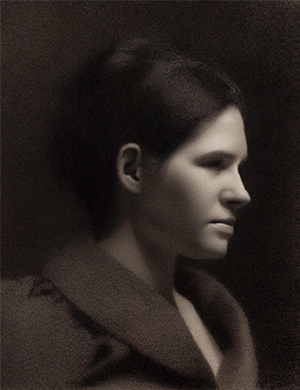 If you go back to the reference photo, you will notice that the left side of the face (the model's left, our right), is generally darker than the right side. Another way to begin rendering is to put down a light value across the whole left side of the face before continuing to shade. As you can see, I tend to move around the face as I render. For example, I might start with the hairline (which is often a nice soft edge to begin shading from), move to the cheek, then the chin and so on, without shading any one area to completion. I do this so that I have more and more values to compare, minimizing my chance of drawing inaccurate value relationships (not a clue what those are? Read about them on the Value Drawing page!). 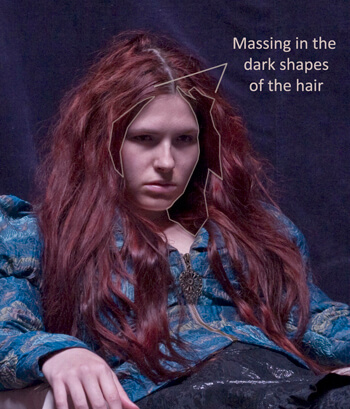 The hair must describe the form of the head. Let's face it, the form of the head is basically an upside down egg. No matter what the model's hairstyle, there is usually an area of hair that lies flat on the head and reveals the form. It is this area that is particularly important to pay attention to, otherwise the hair won't look believable, or the skull may look strangely shaped. For example, the light must look like it's coming from the same direction and have the same intensity or brightness throughout the drawing. 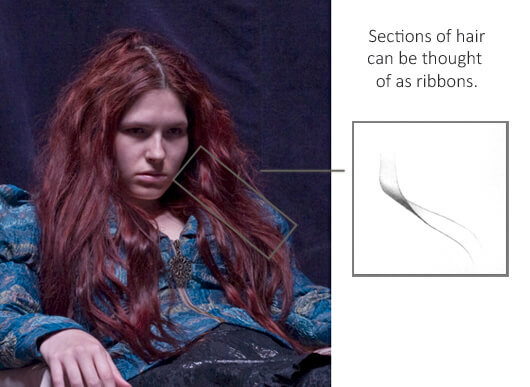 Finally, you can think of sections of hair as ribbons that have a thickness and texture. What form does this section of hair resemble? First, I drew the carefully observed highlight shape. Then I drew the shadow shapes, because finding the half-tone (or middle value) is easiest when you first have the two extremes: light and dark. Finally, when I was happy with the dimensionality of the hair, I drew just a few individual strands to create the illusion of texture. Notice how few strands I had to draw on top of the form to achieve the illusion of hair. Note: The left side of the model's face (on our right) is slightly darker than the right side. To create the illusion that the hair and face are being lit by the same light source, the left side of the hair also needs to be darker than the right side. slightly, usually with a highlight and halftone. I am working from general to specific as I draw the hair. For example, about halfway down the hair on the left, light illuminates all three sections of hair. In the step before this one, I noticed this and made them all the same, lighter value. In this step I looked more specifically at each section and defined the shapes with highlights and subtle half-tones. Notice that while they all look ribbon-like, they are not repetitive and each has a unique shape and curve of its own. Here is the completed drawing! It is important to break up the outside edge of the hair so that it's not one continuous line, or the drawing will look like a sticker on the page. Create variations in edge quality (softer and sharper edges) for the most believable effect. You can also draw slight gradations around a few areas of the outline, as I have done, so that the hair doesn't end too abruptly. Finally, the contour is a great place to have fun adding flyaway hairs!